You don’t have to be a devoted cyclist to explore Norway from the seat of a bicycle. We’ll help you find easy routes everyone can enjoy, including families with children. Do you prefer leisurely cycling by the coast, through green valleys, or along deep blue fjords rather than reckless adventures in untamed nature or up and down gruelling hills? No worries – Norway has lots of options. The nifty thing about many Norwegian cycling routes is that even long, tough trails can be segmented into easier, bite-sized chunks. So just because you are a beginner or have young children, there is no need to miss out on Norway’s classic cycling destinations like Mjølkevegen and the Telemark Canal in the south-east, Helgeland in Northern Norway, and even some parts of Rallarvegen in Fjord Norway. Scroll down for a selection of short and sweet cycling options. Norwegians have definitely discovered the joy of cycling in the last few years, and it has become quite easy to pedal your way around the country. There are plenty of places for bike rental and repairs, and many accommodation providers have joined the “Cyclists Welcome” scheme, which means that they are fully prepared to host cycling tourists. If you plan a family holiday on the two-wheeled skeleton, we bet you will find something that is both fun and easy amongst these selected cycling offers. You can also find further family-friendly cycling ideas at cyclingnorway.no. • Keep to the right. • Give way to those coming from your right. • Don’t drink and bike. You may cycle on the pavement, but adapt your speed. You may not cycle on motorways and dual carriageways. Only children under the age of 10 may be carried as passengers. Always wear a helmet when cycling. A high visibility vest is a good idea, especially on busy roads. Cyclists Welcome is a scheme that can be found in many European countries, including Norway. 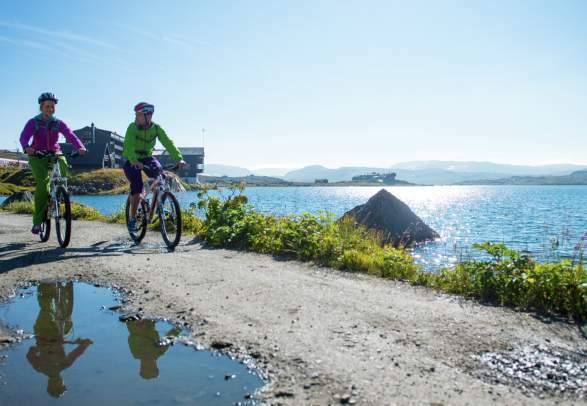 Companies in the collaboration – accommodation providers, tourist information centres, and destinations in Norway – commit themselves to be excellent hosts for cyclists. They will offer secure bicycle parking, repair kits, information about nearby routes, public transport, where to eat along the way, and much more. Bicycle tours in Destination Uvdal.
. They will offer secure bicycle parking, repair kits, informations about nearby routes, and much more.
. They will offer secure bicycle parking, repair kits, information about nearby routes, and much more. There is no need to wait until you’re here to find out where you’d like to go. Filter your search and check out the offers below.